In our Media Arts program, we regularly have forums. In these forums, we talk about things happening in the school or we have professionals come and talk with us. 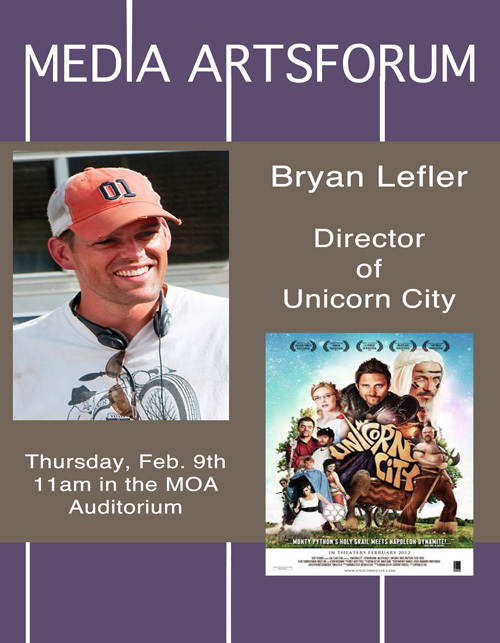 Today's forum, Bryan Lefler was invited to come and talk about us about his experience making Unicorn City. And in one of my classes, we have to write a one page paper about the forum. So, down below is the paper I wrote. It's an academic paper so the tone is different than normal. Bryan Lefler, director of Unicorn City, told about his experience getting this movie made. I found it really interesting to see the kind of problems and obstacles he had to overcome. Sometimes we romanticize the industry, thinking about being rich and famous or whatever. But, listening to him helped me to remember life’s not all peaches and cream. It takes a lot of hard work, persistence and can be detrimental to your personal and family life. There were a few things that he said that stood out to me. He pointed out the importance of learning on somebody else’s dollar. This I have heard before. However, I never had considered editing to fall under this category. While editing somebody else’s footage, you notice shots they miss or whatever. This can help you improve your own projects you shoot. He also talked about the advantages of being script supervisor. Be being script supervisor, you are right there next to the director, seeing what he does and hearing what he says. It sounded like a great way to be next to and learn from the director. Bryan also talked about dreams. Nobody cares about this (except for your parents) unless you are an investment. If you want to get your dream made, you have to show that you will be an investment. Also, making a movie doesn’t mean anything unless people know about it. He was asked if he had any roads paved for him now. He answered “no” because nobody knows about his movie. He said that he’s in our very position right now. And he’s not going to go anywhere until more people know about his movie. He was also asked concerning his audience. He is a “Mormon Filmmaker” and was asked why he didn’t have any references to Mormon culture. He answered: “Why on earth would you market to just LDS? It makes no fiscal sense to do it. I want the Baptists’ money. I want the Catholics’ money.” He made a very good point. By making a movie aimed to a Mormon audience, you dramatically reduce its reach to a very small group. By just making a family friendly movie, without any LDS references, you have a movie with a lot wider audience. Mormons will see it regardless. And others won’t be turned off by the subject. So, by not excluding various groups, more people will see your movie which results in more money being made. In regards to the audience, he talked about the importance of knowing who you’re aiming towards. He wanted a PG rated, family film. That way it will reach a broader audience. However, he had a few problems with some of the actors and producers. They wanted to add some vulgarity to it, so it would sound more “natural”, and make it PG-13. But, Bryan knew who he wanted his audience to be and kept the dialogue clean. Normally I’m not a fan of stories like these. I’ve had too many experiences where people tell their success story and that’s it. But Bryan talked about his predicaments and explained how to avoid or overcome them. It was a very informative and helpful forum. If you want to watch the official trailer, click HERE.